The neighborhood of Arbor Heights is at the southern end of West Seattle. Homes are definitely more affordable here, and I believe there will be good appreciation for homeowners and investors. Arbor Heights has always been a little out of the way for some, but it is being discovered by many now. It has been considered a bit of a sleepy area, but is now "waking up" a little with new construction and the brand new Arbor Heights Elementary School. This area is also served by Denny Middle School and Chief Sealth High School, both of which were recently built. Much of the area is flat with no views and affordable homes, but keep going west and you'll find spectacular water views. And also note, some of Arbor Heights is in the 98136 zip code, so please check that page as well. The name says it all. There are many wonderful views of Puget Sound here. One of the main roads through this neighborhood is Marine View Drive. Though it is an arterial, you will find many great homes that are nestled down driveways and feel away from the moderate traffic this road gets. The area is located between Arbor Heights and the Arroyo neighborhoods. Follow the road north down to Endolyne Joe's restaurant and then on to the Fauntleroy Ferry and Lincoln Park. The Arroyo neighborhood was designed and built in the late 1950's and early 1960s. Nearly every home has a beautiful view and they all have access to their own little shared private beach. Values are high in this neighborhood because of the great views and also because the homes tend to be quite spacious. Prices continue to rise here, and the community is extremely quiet and neighborly. Being in the south part of West Seattle, residents think the trade-off of being a bit further away from things is well worth it. It takes driving down a long and winding road through the woods to arrive at the ritzy area of Seola Beach, where one finds beautiful waterfront homes off a quiet road. It is easy to forget you are even in the city. Prepare to pay quite a bit to live here, but it is a lovely oasis that is still close to all the conveniences the city has to offer. 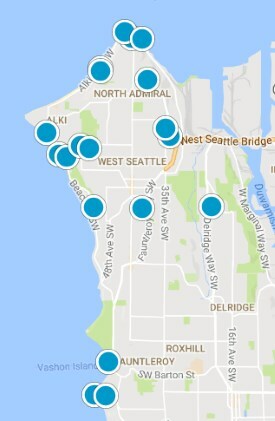 Note, however, that Seola Beach is not in the Seattle city limits. 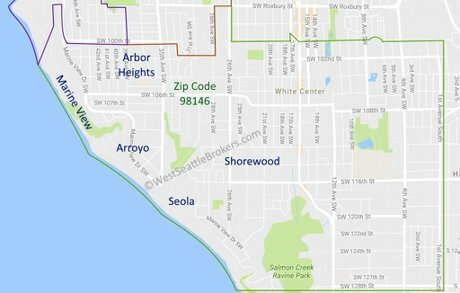 The zip code of 98146 also includes Shorewood, but it is not in West Seattle or in the Seattle city limits. Shorewood has its advantages though, such as more house for the money. Developers have also rediscovered this area recently, so there are many new homes being built at much more affordable prices. Keep this area in mind, unless you need to stay in Seattle for the schools.